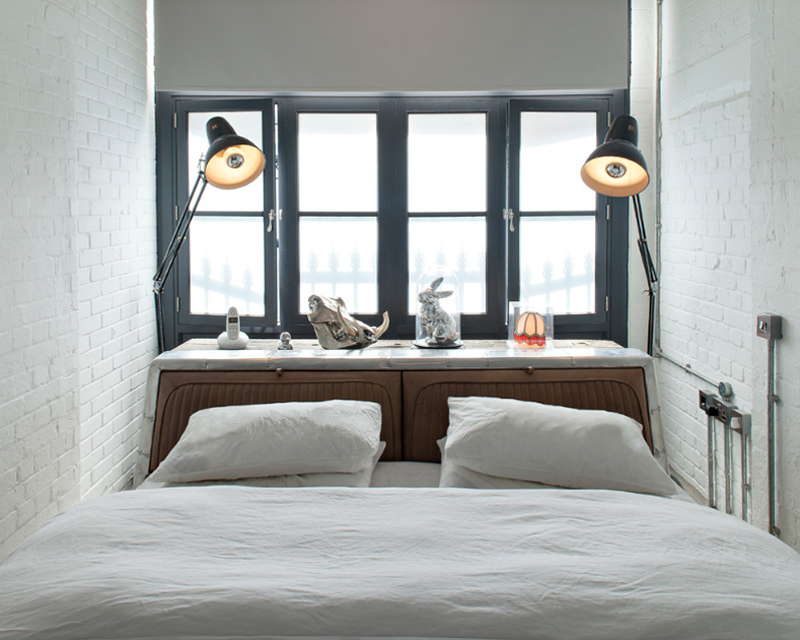 Industrial bedroom design or not, you will surely appreciate industrial lamps in it. Industrial decor, fixtures or furniture are not only added to industrial or mid-century spaces but even in contemporary spaces as well. Today, we have a wonderful list that covers a whole range of bedroom spaces wherein industrial lamps made a whole lot of difference. 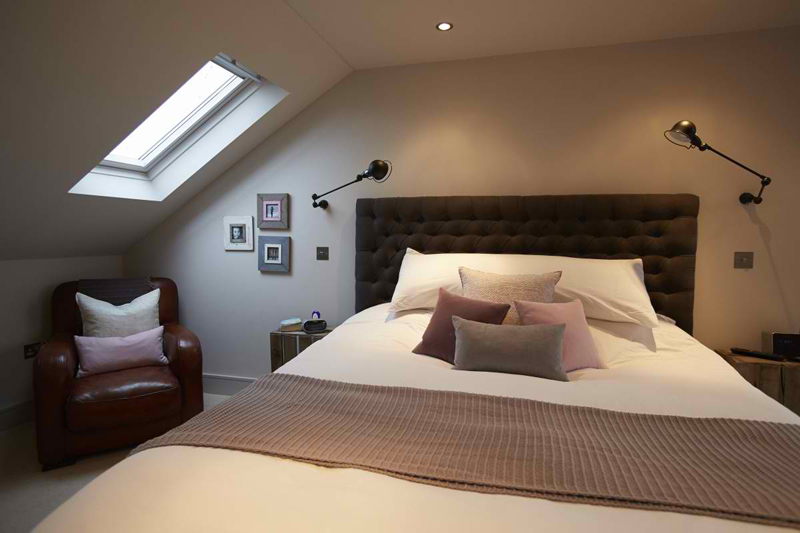 These lamps, along with the bedrooms give off an informal vibe but still maintaining a wonderful feel and drama. Whether or not you are you are into lamps, I think that this list is quite a wonderful list to check out. Although of course most industrial lamps look similar from one another, I think their color or size somehow makes a whole lot of difference in the bedrooms that you would be seeing below. 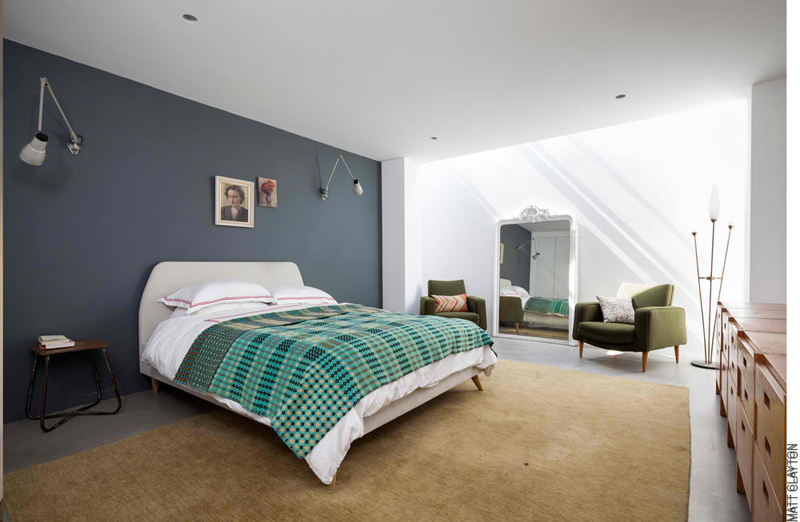 Check out the bedroom photos in here and tell us what you think! A cool approach to a more interesting bedroom is to actually to add things that somehow do not make sense but of course still create that mysterious vibe. This bedroom has that and the fact that this is actually one small space makes it all the more wonderful. Minimal and on point. This sure is a charming bedroom. The white and green combination is something I think people really love. We all know that green is the best color you can stare at for your eyes to really relax and all that. I personally love the head board and the heart on the wall. What do you think about the cute pillows in here? I do not really love the red wallpaper but I think that it sure looks cool against the black and white and somehow pink themed bed. Using a red accent wall always does the trick especially when you have white walls. The bronze industrial lamps somehow interests me because of how pretty they are against the white night stands. 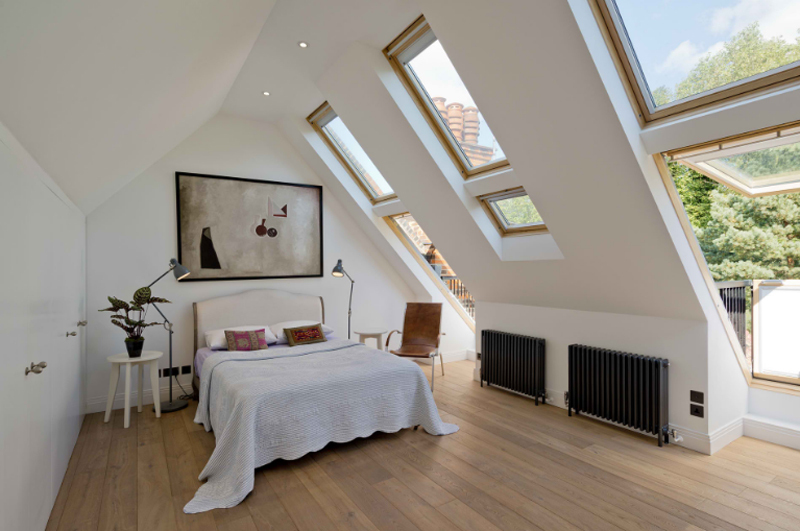 A wonderful looking loft bedroom with all the right things to actually make this bedroom pretty amusing. 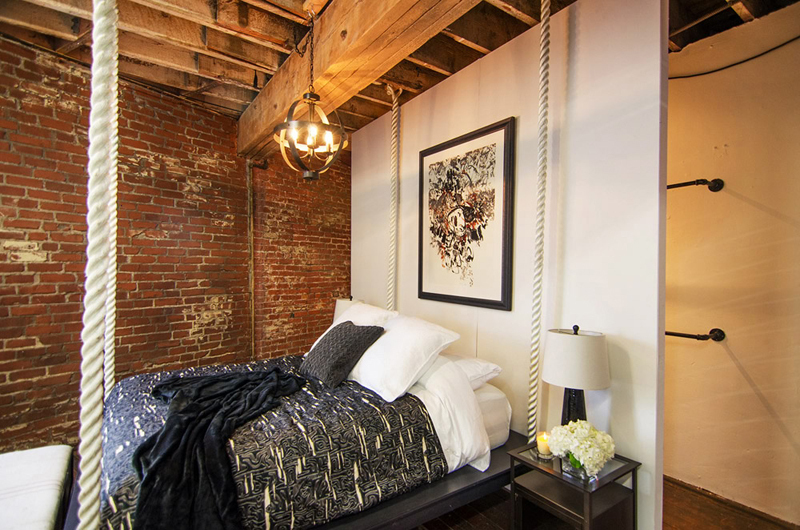 The brick wall which is complemented with the ropes that somehow holds the bed together; the exposed ceiling which is adorned with the industrial chic chandelier. At first, I thought this place is named Never Square. Well, that sure was wrong wasn’t it? 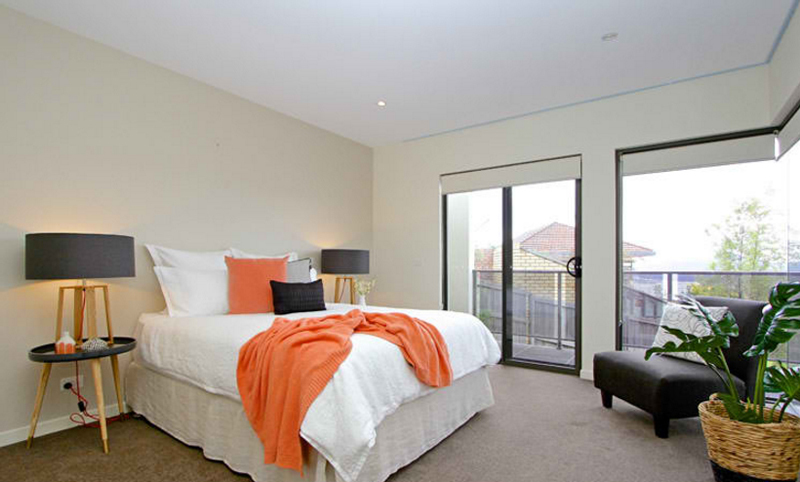 What do you think about the lamps above the bed? It totally makes this space pretty awesome because of the black and white contemporary look that it actually has. I totally dig it! Notice what a wonderful design the wallpaper has which actually makes this room pretty interesting. 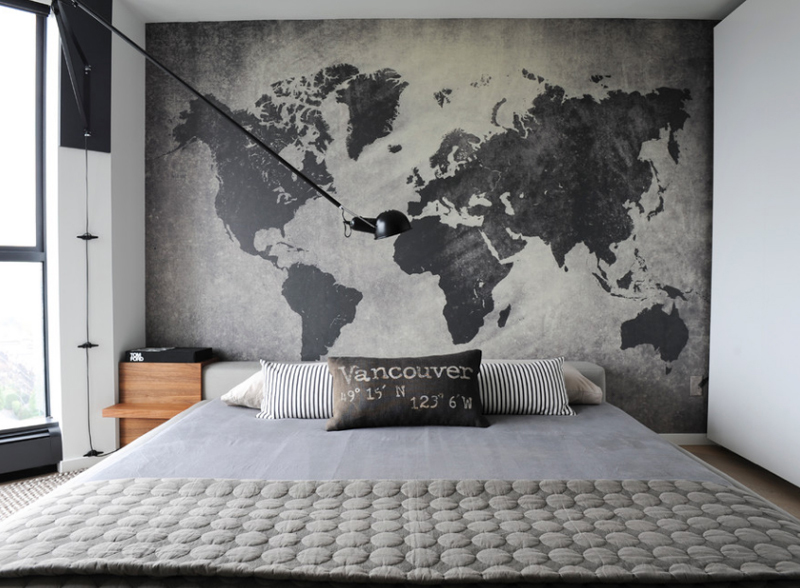 I would assume that the owner of this bedroom loves to travel or well, loves maps! I’m not any good when it comes to maps, so I can’t tell you where this place is. 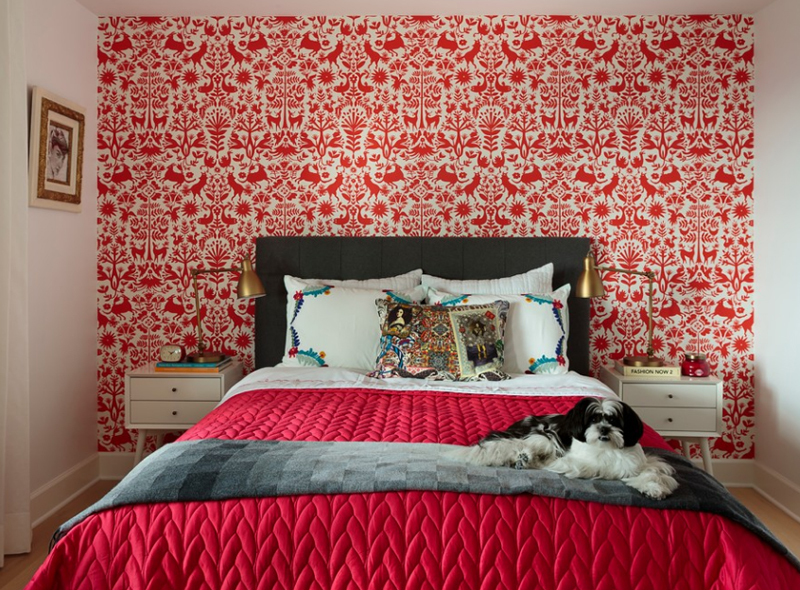 Still, wherever it is, I think that this wallpaper completes this bedroom! I can’t say for sure if it’s an aquarium beside the bed (with a snake in it), but I think that it’s a wonderfully designed night stand with cute trinkets and a lamp on it. The four poster bed is quite a charming furniture too; not to mention the fun and neat looking carpet added to this space is just sweet. Adjustable industrial lamps that adorn the wall on each side of the tufted head board is seen in this bedroom which looks like something you can find in an attic – because of the slightly slant wall with a window. I love the fact that this space has a wonderful aura to it. I do not really like the lighting this bedroom has. I wish that that they somehow created a homey ambiance to accentuate this white bedroom. The lamps beside the bed are quite interesting and unique. What do you think about them? They’re glass and somehow looking like an inverted vase of some sort. This bedroom has a wonderful eccentricity to it. Different night stands, different lamps which I find really interesting and fun. The grey walls complement well with everything inside this bedroom and the hint of blue and violets in here is just neat. There are a couple of lamps seen in here which I think creates a certain vibe. I like the lamps on the night stands and the one behind the unique sofa on the right side of the window. This bedroom has a wonderful ambiance which seems to make it more conducive to sleeping and relaxation. 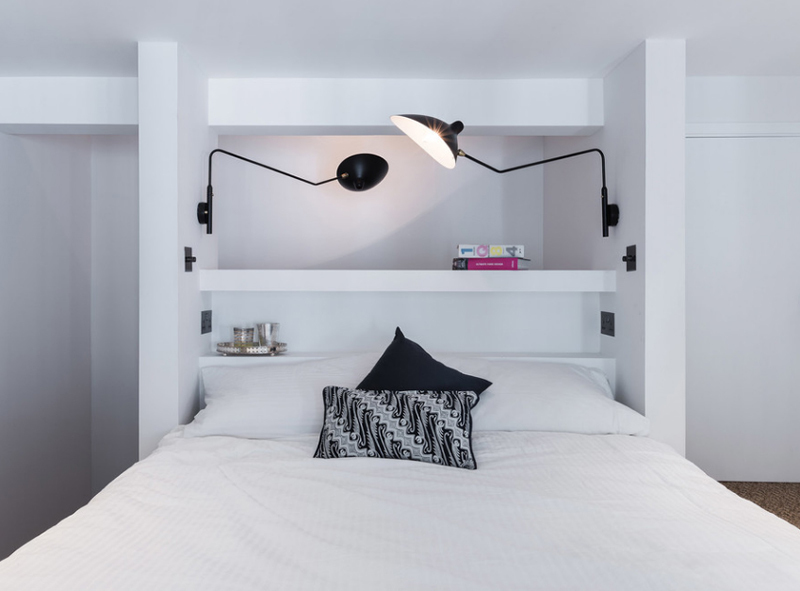 Awesome industrial floor lamps are seen beside the beds which not only give enough lighting at night and at the same time create a dramatic effect during the day. As you can see, this bedroom has enough day lighting as it is, so lighting during the night is pretty much covered by the lamps. 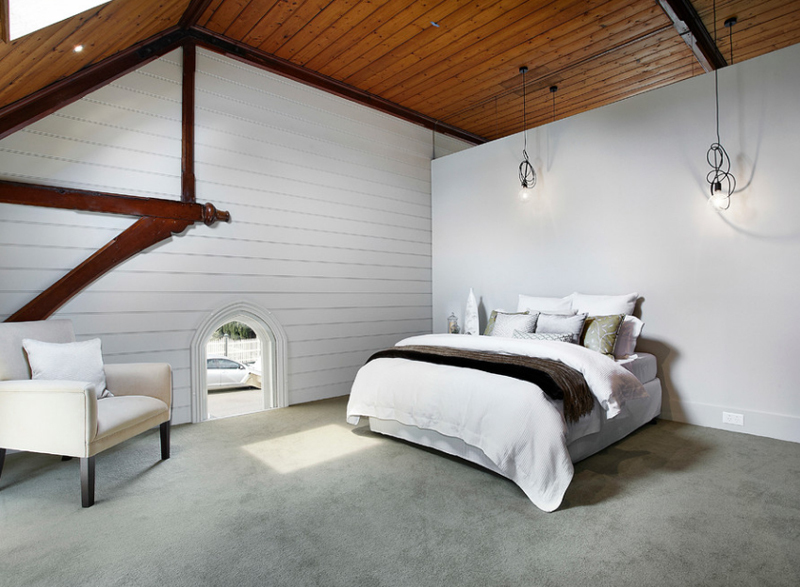 This bedroom looks like some building converted into a house. The large space, wide walls and high ceiling creates a hint of a church feel to it which is kind of amusing. I love the fact that they really added a large, stuffy bed to complement the large space; color and textures on this space is quite a sight. 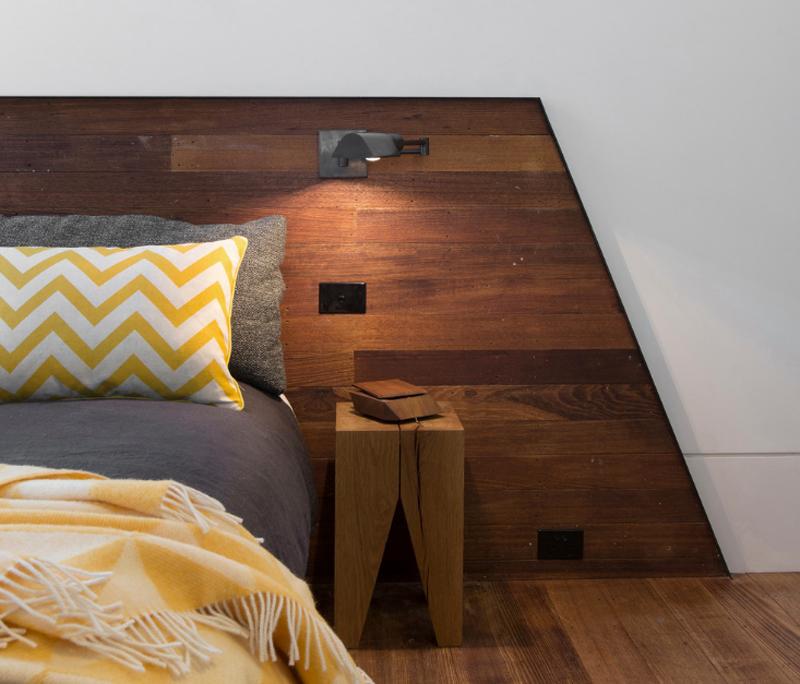 Take a look at the cool industrial lamps beside the bed. It’s so cool because it has dual purpose – a night stand lamp and at the same time, a night stand! There’s a cute tray that holds the things you have before you sleep like your phone or drinks and maybe your keys and your journal or book. What a cute bedroom! The colors, prints and decorations in here somehow makes it all cute and really girly – I love it! The industrial lamps in here may not be the center of attraction (honestly, I don’t even know what is) but seeing it in this bedroom somehow completes the entire look this bedroom is aiming for. A contemporary bedroom with a simple but cool accent wall and a cute hanging night stands or well, shelves. The color of the bed linens match the color of the carpet which I think is cute. I mean, I love blue, so this bedroom would really work for me. 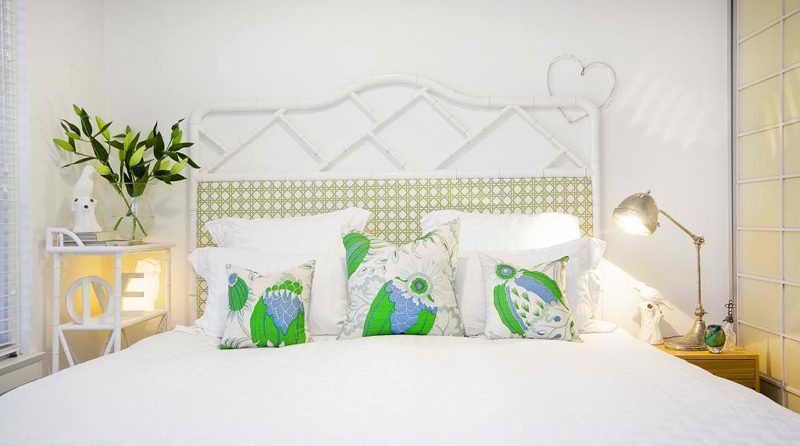 Here is one bedroom that we have already featured before; a pretty large bedroom with the cutest decorations and furniture that completes the look of this space. 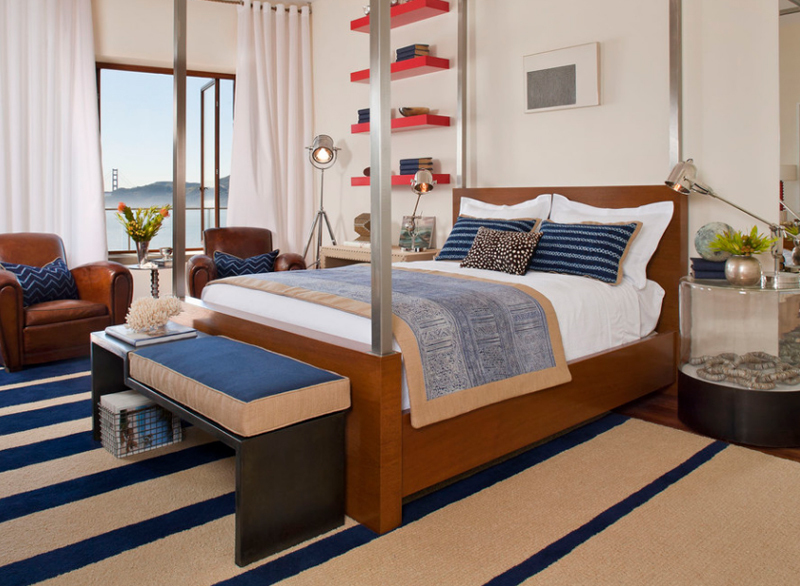 I love the blue accent wall and large area carpet which is in brown. If you notice, I think the cabinet across the bed is mid-century and it’s a total classic. I know that this is pretty much a stretch – not showing you the entire bedroom but I think that the portion of this bedroom is enough to show you how stunning that accent wall is, the flooring and the cute night stand and even the industrial lamp above it; and what do you think about the yellow and grey combo happening in here? What about that? 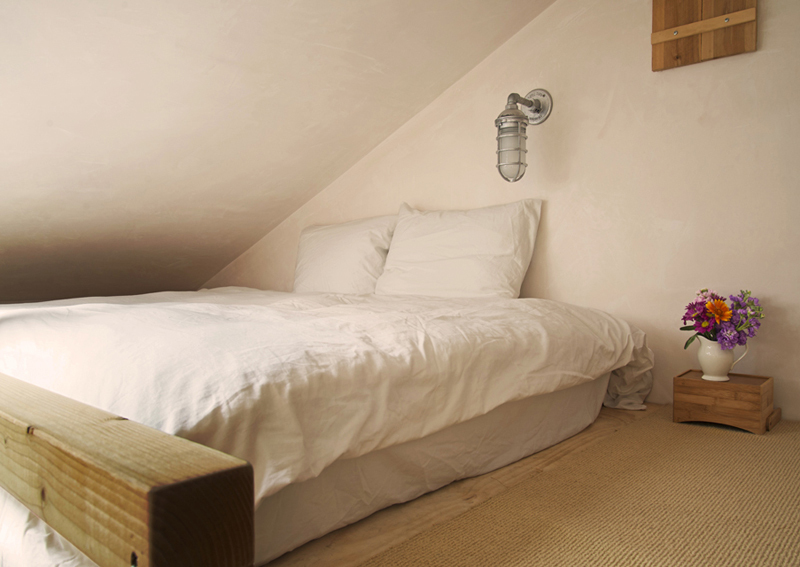 An awesome, definitely an industrial lamp just above the bed. I’m worried that there would be times that the person using this bed would hit the lamp; but then again, the position of this lamp is ideal for when you’re reading a good book before bed. 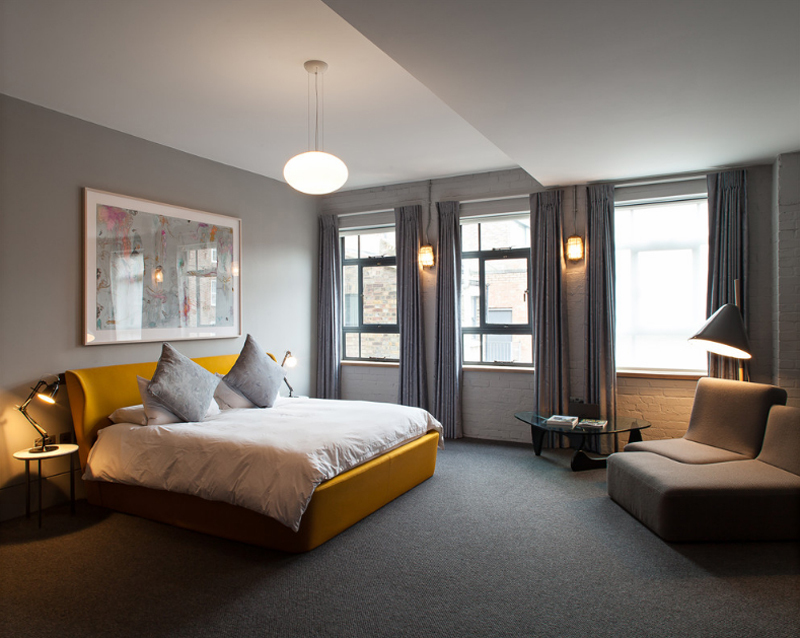 Look at the adjustable industrial lamps in here – two beside the bed and the other one by the seating area. The colors seen in this bedroom is quite charming. The red, white and browns in here create a very homey feel to this space and I think that it’s quite appealing. There you have it guys! An awesome list of 20 Wonderful Industrial Lamps in the Bedroom that I think is just an amusing sight because they make each space interesting. The 22 Modern Bedroom Designs with Reading Lamps is another list that I think you’d find interesting too. Do check out that list and share them to your friends.